I only found out about the Paradise City Arts Festival a few years ago. It is now one of the events on my "must attend" list. The big reason for that is the sculptures this man, James Kitchen, creates. This is an automotive blog, not an art blog, but there's a reason I'm posting this. Kitchen creates amazing sculptures out of scrap metal. 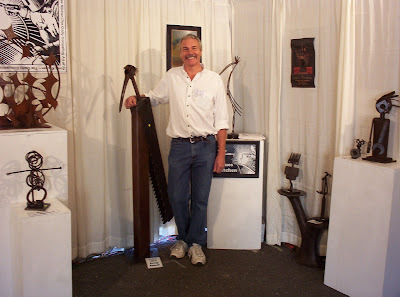 Not all of that scrap metal is automotive related, but if you look closely at his sculptures, you'll see a leaf spring here and there, an old flywheel, a valve, etc., etc. 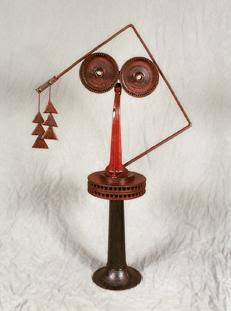 The sculpture below, called "Visage" uses a couple of ventilated brake rotors. This man's talent is truly incredible. Some of his works are small enough to fit in your house and on a table, others are enormous outdoor sculptures. Check out his website. You can find it here. I've spent hours looking at his sculpture galleries, admiring his work. It's really great stuff. Your ingenuity in this blog never ceases to amaze... This guy's art is great!! Your Beemer's done well. I noticed you have kilometer markings inside the dial. Was this car a Canadian import? Or do US cars all have these markings? You must be from my neck of the woods. I attend the Paradise City Arts fest each year. James' artwork is really brilliant. keep up the good work. I like the little non-car posts now and then. Aren't cars just big sculptures? This post was great. I concur, the artist's work is "brilliant" and a few non-car posts keep things interesting.